Programming note: Today, Wednesday, I'll be joining the great John Oakley north of the border on Toronto's AM640 live at 5pm Eastern. Afterwards, I'll be south of the border with Tucker Carlson on Fox News coast to coast at 8pm Eastern/5pm Pacific. If you're a Mark Steyn Club member and you have a question you'd like me to answer on this week's Clubland Q&A, you can lay it on me right here. Britain goes to the polls tomorrow, and Theresa May seems all but certain to be extending her stay in Downing Street - despite having fought a remarkably inept election campaign, in the course of which 29 people have been killed in terrorist attacks by "known wolves" so known that one had been reported to MI5 by at least three foreign governments (the French, Italians and Americans) and the other had starred in a Channel 4 documentary called The Jihadis Next Door. I joked on Monday morning that the latter was Emmy-nominated for Best Jihadist in a British Extremism Documentary, but these days all the satirical fancies are humdrum reality: It seems the show was nominated for Best Documentary in Britain's prestigious Grierson Awards and Best News and Current Affairs in the Broadcast Awards. We are all supposed to be shocked by the recent poll finding that two-thirds of British Muslims would not notify the police if they knew of a terrorist sympathizer, but really one can hardly blame them given the authorities' lethargic attitude to those who do get reported. Likewise, there is something of a pro forma quality to Fleet Street's coverage of these latest atrocities. The worst civilian massacre in the United Kingdom between the Second World War and the 7/7 attacks of 2005 was the Birmingham pub bombings of 1974. For good or ill, it convulsed the nation. In contrast to the now traditional response that the worst thing about an Islamic terror attack is that it might lead to a "backlash" against Muslims and the urgent priority is for everyone to pretend that they're "united" in "one love", the pub bombings led to the immediate cancellation of the city's St Patrick's Day parade, the third largest in the world, for the next decade. Twenty-one Birmingham pubgoers died that night. Now 22 people get slaughtered at a pop concert, and the public shrug it off with some candles and flowers. Eleven civilians were killed in the 1987 Enniskillen Remembrance Day massacre (a twelfth died after 13 years in a coma), and public outrage was so fierce that the Dublin parliament passed a fast-track UK extradition bill, the IRA apologized, Sinn Féin's electoral support didn't recover for 15 years, and Bono declared on stage "F**k the revolution" - which on the whole I prefer to Katy Perry saying touch the person next to you and tell her "I love you". The inertia in today's Britain seems telling. We are, as the French Prime Minister and the London Mayor and other eminences have advised, getting used to it. Terror doesn't appear (from this distance) to have played much part in the election campaign: in a certain sense, the remorseless Islamization of Britain seems to have passed beyond politics. If you still think the major parties can ameliorate the situation, Mrs May is just about preferable to Jeremy Corbyn: In a choice between a dissembler and a dupe, vote for the marginally less unsafe pair of hands. If you feel the need (as they did after Enniskillen) to be outraged and impassioned, direct your outrage and passion wisely and join your fellow Britons in excoriating the President of the United States for Tweeting about the Mayor of London. If you feel the need (like Mrs Thatcher after South Georgia) to "rejoice, rejoice", join the patriotic employees of LBC radio in cheering the defenestration of Katie Hopkins, also for Tweeting. If you feel the need (as Mrs May's COBRA meeting did) for an instant policy prescription, then draw the logical conclusion from the above and blame the Internet. The Prime Minister's plans to lean on Google, Facebook et al will discombobulate the next bombers not a whit, but they'll almost certainly lead to a Robert Spencer or Geert Wilders having his YouTube channel taken down or Twitter account suspended, and that's great news, isn't it? In similar spirit, the aforesaid mayor has called for the aforesaid president's upcoming state visit to be kiboshed. Given the current levels of vigilance by UK officialdom, it wouldn't entirely surprise me if Trump were to be declared persona non grata but still sailed through British immigration to bang on the door of Windsor Castle asking where his state banquet is. Or perhaps I'm doing the amusingly named "UK Border Force" an injustice: Unable to prevent even the most obvious "Soldier of Allah" from breezing past the desk at Heathrow in his Isis T-shirt, they mysteriously discover hitherto unknown levels of efficiency when faced with such threat priorities as Pamela Geller or Michael Savage. Maybe Mrs May will set up a PREVENT program to prevent Katie Hopkins, or Douglas Murray's book tour. That's not an idle fancy: the Prime Minister is no friend of free speech, and, as we've seen in the last few days, the biggest obstacle to "getting used to it" is a relatively small number of people who keep harping on about it. Mayor Khan is a slippery customer, and he used a slippery phrase in reassuring the public after Saturday's carnage: London, he declared, was "one of the safest global cities in the world". "Global city"? What is the difference between a "global city" and a mere city? The latter are more or less ethnically homogeneous places with insufficient vibrancy and diversity for the likes of Mr Khan. A "global city" is a microcosm of the global. Saturday's dead, for example, number four of Her Majesty's subjects (one English, one Canadian, two Australian) and three citizens de la république française. In part because of the socialist sclerosis of that republic, London has become home to one of the largest French populations on the planet. That's a "global city" - where an Aussie can head across London Bridge to a fashionable pub and fall into conversation with a charming demoiselle. All these Canadians and Australians and Frenchmen were killed by a jihadist born in Pakistan, another born in Morocco, and a third from either Morocco or Libya. In London and the other "safest global cities in the world", a New Zealander can meet a nice Danish girl and be blown up by a Yemeni on the way home. The conceit of the global city is that there is no distinction between a Dane and a Yemeni. In his new book The Strange Death of Europe, Douglas Murray returns periodically to a vital question: What happens when global cities become "global countries"? By 2011, "white British" were a minority in 23 of London's 33 boroughs. A similar transformation is well advanced in every city down the spine of England from Manchester and Leeds to Birmingham and Bristol, in all of which Islam is the principal source of population growth. For the most part, citizens of the new west accept that as a normal feature of life - while still expecting to find Cornish villages full of Cornishmen or Welsh market towns full of Welshmen. But soon we will have not just global cities but "global villages". Sweden, where most ethnic Swedes now alive will end their days as a minority within their own country, is already trending that way. A few months ago, I passed a pleasant few hours with a young couple who'd moved out of Östersund after a sexual assault by, um, "youths" and settled in a small town about an hour away in order to get away from the aggravation of said "youths". Not as easy as it was. They'd rented a place in a pleasant two-story apartment house only to find, as the chap put it to me, "I've got a f**kin' mosque in my basement." In a municipality of under a thousand people. There's a funny thing you notice about "global cities". In Camden and Chelsea, the French and the Aussies and the Danes and the Kiwis all jostle along side by side. But in other parts of the metropolis the world city gradually becomes less worldly: in much of the East End, in the neighborhoods where the police were conducting their post-terror raids, the Jews have gone, and the gays, and a lot of the pubs and fish'n'chip shops are closing up. You can detect the same phenomenon in the heavily Muslim neighborhood of Manchester where Salman Abedi grew up. In the new global cities, certain areas are less interested in celebrating diversity than in enforcing homogeneity. There is only, to borrow from Ariana Grande, "one love". Zachary Gray has a new column looking back to America Alone, with the somewhat depressing (for me) headline: "It Has All Come True: Revisiting Mark Steyn's Predictions." At the time of the book's publication, I was told by British politicians that there was still plenty of time to solve this thing. A decade on, they're now saying, implicitly and sometimes less so, that it's too late to solve it. Neither statement is true. But before there can be action the British people have to rouse themselves to demand action. On Saturday night in Borough Market, when the three knife-wielding jihadists stormed in to the Black & Blue restaurant, they found themselves confronting a 47-year-old football fan. 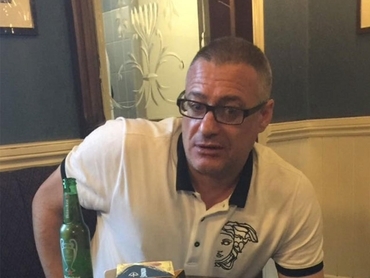 "F**k you," said Roy Larner. "I'm Millwall" - a footie club with supporters of surpassing ferocity. He held the Soldiers of Allah at bay with nothing but his fists, enabling other diners to escape, and is now recovering in hospital with stab wounds to his arms, head and chest. "F*k* you, I'm Millwall" turned out to be the "Let's roll!" of the night. If you're having trouble keeping your London rail termini straight, the Battle of Waterloo was won on the playing fields of Eton; the Battle of London Bridge was won on the playing fields of Millwall. Mr Larner seems disinclined to get used to it - and "F**k you, I'm Millwall" is a more encouraging sign of a societal survival instinct than "one love". But normality soon reasserts itself. This morning, a woman en route to the nursery school where she works was stabbed by three girls shouting "Allah will get you!" Hey, don't worry, the police say it wasn't terrorism, just ...daily life in "one of the safest global cities in the world". Millwall vs Allah: We are the world. ~If you're a Founding Member of The Mark Steyn Club, feel free to log-in and have your say in the Comments section. For more information on The Mark Steyn Club, see here. Just wanted to note that Andrew Bolt was attacked, but he also vigorously defended himself. The attackers fled, as bullies will do when confronted. All is not lost, Steyn prognostications notwithstanding! Three against one. Half Bolt's age. Had the massive advantage of a totally unexpected ambush. Blinded him with some liquid. And still Bolta sent them packing. It was beautiful to watch. Haven't you heard the latest 'truism' being proclaimed from recent sociological studies? You really can't rely on the opinion of witnesses or any of those closely exposed to the trauma....they respond emotionally and thus cannot be taken seriously, they will certainly be 'way' too biased to be able to give a rational opinion. This I learned on Malcolm Gladwell's curiously titled podcast 'Revisionist History'. So only opinions born in the cold halls of academe are really valid, or those held by the elite left. Sad state. Jihad depends on a population being easily deceived and easily frightened. "Getting Used to It" could also mean that people become hardened to Islam and unmoved by the lies of its leftist enablers. Time to start "Getting Used to It", like Roy Larner did. Mark's column is the first time I've heard of Roy Larner and Millwall. And for 3 days I've been thinking that that sort of response is exactly what we need to foster and encourage. Hilarious that the "news outlets" didn't mention it, and that the entire story evaporates in a day from all but the editorials. Ms. May, and others, point out that this is a "war of ideas", but when coercion engages, it is also physical. Yes, let's bring back fighting back. Go Millwall ! Yes. And you rarely hear from victims' loved ones -- e.g., what they think of Muslim enclaves and Muslim immigration. You would think the media would want to know their reactions. Watched the BBC News/UK the other night and wondered why "Roy Larner" was not mentioned when news about the London attacks was on? Goto page and get content with "A Millwall supporter and in my mind a proper hero and deserves our support and aid to help him on his recovery." OK, now let's try "Geoff Ho london attack" – and we find a bbc item on Page 3 / Fourth item down. Maybe I should start to record these, ready for the BBC, to say that for every piece of inadequate reporting that I supply with proof, they can give me £1 back from the TV license. I am getting tired of this deceit by omission. It would almost suggest that we should not fight back? There are too many people acting like we've already lost. We haven't lost. We're not going to lose, not in England, Scotland, Wales, Canada, America or anywhere else in the West. Everybody needs to be making plans about how to win. These are our homes we're talking about. So losing is not an option. Focus on winning tactics and strategies. The new normal is going to be a vibrant West. That's what everybody is going to be getting used to. Of course, I can't say definitively. But I believe that focusing on means gets us into better practice and a stronger will follows that. More generally they each should strengthen the other. One or two dozen people focusing in an organized way on means is worth thousands of isolated people. I'd like it if Mr. Steyn ran a Q&A session with the theme about tactics that we don't have to wait on our elites on, but that we could work on individually or in small local groups. I'm sure that there are many people who would have good ideas that could be floated. That's the main purpose of education today, to jam everyone into their place. I'm tired of having to correct people on what they learned in school. Why don't we just break the tyranny of nationalized testing? The first generation that grew up on it were the baby-boomers and they were a disaster in college. So it may support standards, but there's no evidence that it supports good standards. All the colleges have to do is start to set independent exams and there will be real competition again and the leviathan of the mega-university complex will be broken up. Then people wouldn't feel so compelled to go to college in the first place, and if they did go, they could go someplace that's actually good, and not just second-rate or high-ranked but lousy anyway. Being married to someone who watches every penny I too thought long and hard about contributing to this club but "the 150 big ones" as Carl calls them are a small price to pay. The ladies with whom I lunch are off on their travels again this Aussie winter and three are going to Britain and London as part of their trip. At our monthly lunch yesterday they looked at each other and discussed the dangers when describing where they were staying in London but they are still going there, alas, with fear. As one lady said, "We are tolerating the intolerant" Why? I prefer to refer to Mr. Steyn as the Prophet Mark Steyn, PBUH. Going to the polls tomorrow and I feel no-one represents my views or outlook in life. In Scotland in the 80's& 90's it was only ever a 2 horse race and I voted Labour along with most of my peers of working class background. After witnessing the government's behaviour towards David Kelly and the whole chemicals of mass destruction dossier, I felt I could no longer vote for labour. The SNP were rising at that time and although I did not want independence a dissolved government implementing local policies appealed to me and I voted for them. They have the majority seats in Holyrood and under them education, health and social policies seem to be falling. My children are still at school so education is something that concerns me a lot. The SNP only seems driven by independence and in my opinion have failed to deliver improvements in any area of Scottish life. You only have to look at the disgraceful living conditions of the people in Nichola Sturgeon's constituency, which I think you have touched upon with your trip in the desert where waste and unclean living conditions are a health hazard. There are local community groups in the Govanhill area that have posted footage of the area and it's decline over the past two decades which was also on her watch. Luckily, it is not where I live but it concerns me greatly. I also feel our elites in The West have failed to protect and serve their own nation states. Our governments should be the gatekeepers of those who wish to harm us and destroy our freedoms and our democratic values. Not one of our governments consulted their own people on these issues and our voices were never heard. I' m sure if they had, they would have known the voice of reason and we would have had common sense conversations regarding our immigration polices and how to manage integration more successfully. With these terrible events taken place frequently, the future I fear, looks grim for our children and for their liberty and right to be who they are. So looking at the political landscape I will be voting for the Conservative party for the first time. Maybe it is the best of a bad lot. My mum couldn't believe I would vote for them. How I really feel about it all Can be summed up in the title of a Fun Boy Three album but saying it probably would not be PC. Katy Perry does not merely "Love You." She "Loves ON You." Shudder the thought. There's no time "to solve this thing" because this thing is now another thing. Being myopic is the 1st qualification for "leadership" among the impotent who get elected and then expect everyone to develop vision problems. Well, the Global Joan of Arc has emerged in America in the form of the contract-twit, Reality Winner. It's hard to say who will fill the chain-mail role in France or if there is any Braveheart (anywhere) in the Kingdom United by fear. 5. Praise for the non-participants. A good way to appreciate how far Britain has fallen is to view the wartime move "Went The Day Well" which was rescued from obscurity by TCM last year. It's not just that Britain lost so many good men in WWI and most of the rest in WWII; they lost too many men altogether. How else could Churchill(!) be fired in 1945 (for God's sake) and the NHS instituted at the same time. Will there be sufficient UK incidents to warrant an awards ceremony? Did the bullying program made wimps of everyone? Instead of allowing children to settle matters quickly amongst themselves, education steps in and demands only the 'authorities' can act. So children grow up to adults cowed to wait for someone else to do the job - ineffectively? Still shaking the head that only three knife attackers on a street with hundreds and hundreds of people and they did that much damage? Are resto/pub tables and chairs bolted to the floors - is that the problem? No loose bricks? All those heavy bottles of whisky on bar display are better in hand than air. A crowd can easily knock down anyone with stones. Pitched dirt or sand will blind an attacker - keep pitching until they start staggering, time for others to grab heftier objects. Saw a fight once at the parking - one guy against three. He unscrewed the antenna from his car and started whipping. It's absolutely devastating. Maybe everyone needs to watch a Jackie Chan movie to get ideas that anything detachable in a room can be used for defense if applied quickly and violently. Broken china plates can be replaced, people, not so much. But the lack of teamwork makes UK look like A Bug's Life, the little guy masses intimidated by the bigger bugs which spend their time scaring them into being convinced that they can't do anything about their lot in life. You may recall that in one of Hemingway's short stories a lad working in a Spanish restaurant dreams of becoming a bullfighter. His friend tries to dissuade him by tying a couple knives to the bottom of a chair's legs, and tragically kills him. I'm the sort of fellow who flees bar fights when possible. I can tell you, the four legs of a chair or three legs of a stool, while not the match of a Spanish fighting bull's horns, are very useful in clearing a path. See also David Drake's Jed Lacey stories. Or James Bassett's Harm's Way, where Paul Eddington describes a broken bottle as better than a boarding cutlass. It's all about perception, if you're a politician. An energetic, confident, charismatic denial of reality works almost every time, especially if the media is in on the deception. Happy faces, hope and change, and promises that are impossible to keep, are all the grist that is required to keep their mill grinding merrily along. The problem comes when they are faced with an implacable enemy. Whether that enemy is the head of National Socialism in Germany, commanding world class technology, or some muslim jihadists bottom feeding on technological detritus that can be easily misapplied to create mayhem, these antagonists are not influenced by a politician's warped reality. But the political class is incapable of comprehending the consequences of this mismatch. In a politician's view, the important thing is to keep the news focused on happy faces. If we would only ignore the terrorism, it wouldn't be a problem; in fact there would be no reason to engage in terrorism. This is either a childish projection of their own world view that is regrettably inappropriate, or it is an extremely cynical abuse of their position of responsibility, bordering on an mindset that is just as evil as the jihadist's. I tend to think that anyone with a room temperature IQ would have difficulty reconciling the reality of a "global city" with the notion that this is just a problem of perception. But then again, when Churchill became Prime Minister as France was collapsing to the Nazis, he kept Chamberlain on as Lord President of the Council, suggesting that Churchill thought Chamberlain made an "honest mistake." Which is to say that even very capable men, like Chamberlain, may be incapable of understanding the motivation of other men, like Hitler, if they are sufficiently different. It could be that their gifts blind them to their own limitations. I desperately hope that Mrs. May will be successful tomorrow, and I hope she will have an epiphany that allows her to comprehend the dangers that face the UK. England's going to win. And the whole West will win too. Our side has got to stop stabbing each other in the back. Don't pay any attention to people who say there are no solutions. There are always solutions. We even know some of them already. Cut off their funds. No more Western money should go to any of these worthless Allah invoking creeps, not one single penny. Calling someone rich is just paving the way for legalized theft. You're neither rich nor privileged if you can be constantly insulted and then attacked in the street and then not even be allowed to talk back. You know who's 'rich' when you find out who can insult and who can't. We have to end the looting. If the politicians won't do it, then get new politicians who will. That's just the beginning. Then we can start really rolling things back to proper. For all the numerous and varied insults directed at Trump (some even deserved), he at least has the sense to want to defend himself and his country from civilizational suicide. Roger that, Jack. Defending against civilizational suicide -- a bulletted item on his resume -- is huge. Makes him stand out among his feckless peers: May, Merkel, Macron et al. "Get used to it" = the new "motive unknown"!? From the Get Used to It Canada file, reports say this charming young lady was wearing an ISIS bandanna on her head (over the niqab) and was screeching about wanting to attack white Christians, on behalf of ISIS for Allah. She doesn't speak a word of English and a neighbour reported on TV that she wasn't particularly social in the local neighbourhood, and was a recent arrival from Syria (haven't seen this confirmed anywhere). Hey, re the Melbourne attack, no problemo! Australia's main taxpayer funded broadcasting behemoth, the "Australian Broadcasting Corporation" ("ABC", or "Anything But Conservative"), reassures us that the authorities at the dead terrorist's mosque (bet you didn't see that coming!) are adamant that he couldn't have been a real Muslim because he committed a murderous terror attack "during the holy month of Ramadan". Oh, well that's all right then. Glad that's been cleared up. Phew. I feel *much* better now. I guess the ABC (you sure it's not 'Always Broadcasting Crap') has its very own Imam and Department of Official Fatwas? If the GIs seventy-three years ago could have taken a DeLorean to England and France circa 2017, do you think they'd still have risked life and limb on those beaches? "But normality soon reasserts itself. This morning, a woman en route to the nursery school where she works was stabbed by three girls shouting "Allah will get you!" Hey, don't worry, the police say it wasn't terrorism, just ...daily life in "one of the safest global cities in the world"." Apart from not getting beat up, raped, or stabbed by strangers as opposed to being so treated by persons one can identify, what is the advantage of being a Muslima? I can remember (I am an older person) when Western women would not tolerate either. Explain? Europe can't cope with terrorism. The Germans are trying to hug a refugee then find they're wearing a suicide vest, try to calm an economic migrant and an AK47 is in their face. The Middle East/sub-Sahara is not here because they love Elgar or the rolling green British countryside, they know there's easy white underage meat and a benefits system to give them a flat and internet access. Here in the UK we have over 3 million of these primordial sociopaths. Bradford, Rotherham, Birmingham, London...they reproduce at a staggering rate, they hate this nation, it's still a mystery other than the obvious benefits system why they come here. Its's not through any love for the British. If my demeanour is irate it's because I live here, if I'm not adhering quite strictly to house rules it's because over 30 of my fellow Britons have been slaughtered the past three months. Yes I am incredibly angry, govt does nothing but speak platitudes, the public lights candles and the Left blames us. It's like a very bad dream that will not end.